Everything Local: Natural Meat, Baked Goods, Organic Produce, Seedlings, Eggs, Soap & Health Products, Fiber Products, and Wild Edibles. 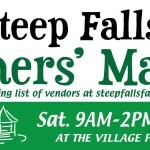 The Steep Falls Farmer’s Market is located at the Village Park Gazebo in the center of our charming village of Steep Falls at the corner of Rtes. 11 and 113. Only 10 minutes west of Standish, Maine. Sandy River Farmers’ Market in Farmington is open Fridays, 9:00am-12:30pm, May through October. The Waterford Farmers’ Market takes places every Monday, 2:00pm-5:00pm, June-September on the Common across from Keoka Lake.